We have a school garden as well as an extensive herb garden that is used for our farm classes. Children work and play in the dirt, following the seasons on the farm: amending the soil, planting, watering, tending and harvesting together. We also grow fresh produce for our animals: greens and fresh forage for the goats, pigs and rabbits. Everyone eats their greens on the farm. 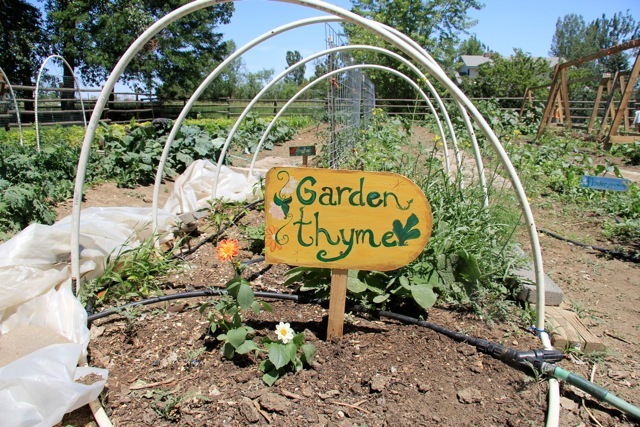 Our herb garden invites us to harvest, dry, and process culinary and medicinal herbs together. When the apples in the orchard are ready, we get to press cider, make applesauce, peel and slice the crisp goodness and savor the taste of Autumn!